The rack-mountable 03D is a self-contained, 26-input/18-output fully-automated digital mixing console in its own right, destined to set new standards of its own. 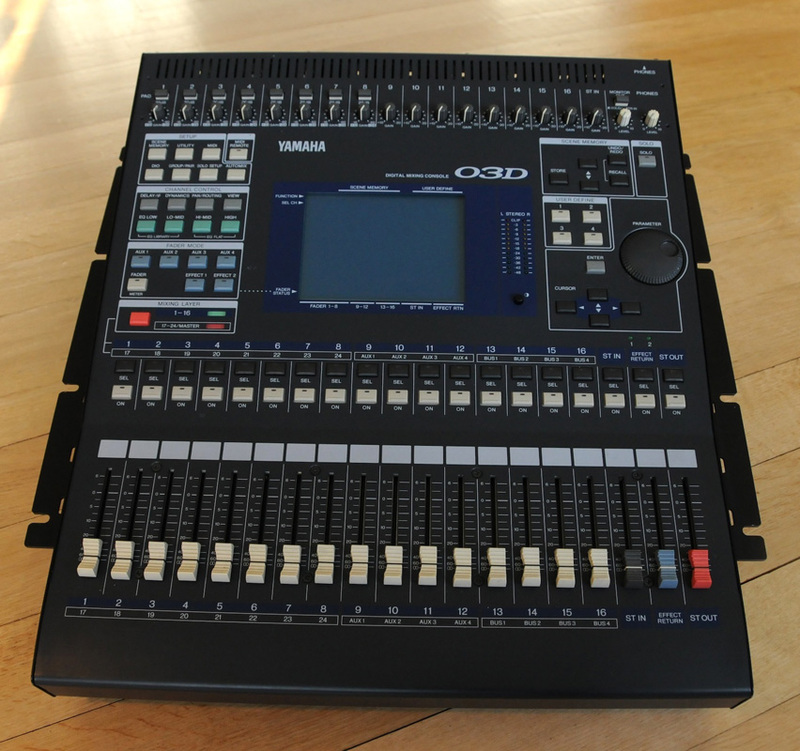 The 03D features an intuitive user interface, ease of operation and a long list of essential professional engineer’s tools – including fast 32-bit internal digital audio processing, versatile analog and digital I/O configuration with 20-bit ADs and DAs, 32-bit onboard multi-effects processors with freeze (sampling) and guitar amp simulation effects, motorized faders, fader and mute grouping, surround sound mixing, scene snapshot memories, onboard automation, MIDI remote capabilities, plus convenient cascading options which make it the ideal companion for an 02R or another 03D. The digital formats variety consist of CD-8AT, TD, Y, CS and AES. The low cost interface is available to a broad range of equipment. The owner can configure the mixer according to changing system requirements. These cards can be installed in a slot at the rear of the console. The 03D’s flexible configuration of analog and digital inputs and outputs makes it suitable for a wide range of professional mixing applications. Included are 24 input channels and a fully-featured stereo input – for a total of 26 inputs plus 4 bus outputs, 4 auxiliary effect sends, a main stereo bus and a solo bus. Stereo digital inputs and outputs, plus 8 digital inputs and outputs (optional, via a YGDAI slot), provide a total of 10 digital inputs and 10 digital outputs. Input channels 1-8 have mic preamps, XLR and balanced stereo 1/4″ phone connectors, individual phantom power switches, and can accept input levels from -60dB to +10dB. Inputs 9-16 feature balanced stereo 1/4″ connectors, support line level signals between -20 and +10dB. All 16 channel inputs feature input gain controls with 30 detents for precise and repeatable setting. Channels 1-2 include analog inserts for connecting external dynamics processors. Aux sends and bus outputs can be paired together for stereo operation and can be routed to the control room monitors for cue mixes, with onboard effects returns included. The four bus and four aux send signals are output via balanced stereo 1/4″ connectors. Coaxial and AES/EBU stereo digital I/O connectors permit direct connection to DAT recorders and other compatible digital devices. The stereo digital input signals can be routed to the stereo bus for submixing, or to the stereo input channel for mixing and processing. The number of inputs can be increased by digitally cascading two 03D’s together, with both sharing bus, aux, stereo and solo busses. The 03D can also be digitally cascaded with an 02R. The 03D’s YGDAI slot – which accepts the same single-size YGDAI cards as the 02R – provides 8 digital inputs and 8 digital outputs for direct digital connection to all major modular digital multitrack recorders (including Alesis ADAT, Tascam DA88 and DA38), disk-based recording systems, and AES/EBU and Yamaha format systems. The YGDAI digital outputs can be configured as bus outs, aux sends, direct outs, or stereo outs – so although the 03D is essentially a four-bus mixer, you can assign the four busses and four aux sends to the YGDAI slot’s eight outputs to achieve eight-track simultaneous recording. The 03D features an array of onboard parametric EQ’s, dynamics and effects processors, with signal processing performed by Yamaha’s custom 32-bit DSP chips – same as in the 02R – and available parameters selected in collaboration with professional sound engineers. Comprehensive libraries of preset EQ and dynamics settings provide a great place to start or for reference, and plenty of user programs are available to store your own. Forty 4-band parametric EQs and 40 dynamics processors are available for all 26 individual channel inputs, 2 onboard stereo effects returns, the 4 bus outputs, 4 aux sends, and main stereo outputs. Each EQ band has a range from 20 Hz to 20kHz which can be adjusted in 1/12 octave steps and a 0.1-10 Q range. High and low EQ bands can be configured as shelving or peaking, with the high band capable of being configured as LPF, and the low band as HPF. EQ gain settings range from -18 to +18dB. EQ settings can also be copied between channels via the equalizer library. The EQ library’s collection of 40 preset EQ programs include specific settings which can be applied to everything from acoustic and electronic instruments to percussion to vocals. Including the 40 memories for storing your own EQ settings, a total of 80 EQ programs are available. Onboard dynamics processors include compressor, expander, gate, ducker and compander functions, and a total of 80 dynamics memories. Any input channel (1-24 or stereo input) can be used as a key trigger, and AUX1 or AUX 2 can be used as a key-in signal for any channel. The dynamics library’s collecton of 40 preset dynamics programs include settings appropriate for the mixing of strings, brass sections, sampled percussion, vocals, and 40 user dynamics programs are available to store your own. The 03D’s two powerful new sets of effects processors – which utilize the same DSP and some of the same algorithms as Yamaha’s ProR3 and REV500 – feature 64 basic presets, with various reverb, delay, echo, chorus, flange, pitch shifting and other effects to choose from, as well as the new freeze (sampling) and amp simulator, or guitar preamp, effects. Including the 32 user memories, a total of 96 effects are on hand. The 03D also features channel input delays of up to 200ms which is useful for microphone-placement compensation for live recording and video editing. Channel delays can also be mixed with the dry signal to provide delay and echo effects. Output delays, for the stereo and 4 buses, of up to 40ms are useful for applications which require delay-compensation on the outputs. Mix snapshots of entire setups, or scenes, consisting of approximately 2000 parameters including all input channel-to-bus routing and output configurations, fader and pan positions, EQ and dynamics settings – everything – can be stored and recalled instantly using the 50 scene memories. Scenes can be recalled manually, by MIDI or using the auto-mix function. A Recall Safe feature permits selected channels to be isolated from scene memory recalls. An UNDO/REDO is also included. 03D’s quick-response, positive-feel 60mm motorized faders function as conventional mixer faders, auxiliary send level controls, and onboard effects aux send level controls, depending on current status. When a scene memory is recalled, the faders position themselves automatically to the levels stored. During playback of an automix, fader movements are replayed automatically in synchronization with MIDI time-code. Adjacent odd/even number channels can be linked in pairs, with panning either independent or ganged. You can control two adjacent channels paired in stereo using only one fader. A crossfade time of up to 10 seconds, in 0.1-second steps, can be set for faders as part of a scene memory. You can auto-fade the stereo output fader using the built-in automation based on MTC time-code, or by setting a crossfade time in a scene memory. Comprehensive monitoring functions include Recording Solo mode, where the Solo bus feeds the monitor output, allowing nondestructive soloing that doesn’t affect the main stereo mix. There’s also Mixdown Solo mode where the stereo output is connected to the monitor output, so solo affects the stereo output. And there’s Solo in Place, where the SOLO bus is connected to the monitor output, and also solo affects the stereo output. With the 03D, surround sound mixing suitable for CD-ROM and DVD productions – as well as audio post applications – is built right in. Three types of surround sound configuratons are available. The dedicated pan page provides precise control. MIDI IN, OUT and THRU terminals permit control of all parameters (approximately 2,000) in realtime using MIDI Control Change and System Exclusive messages. The 03D’s MIDI remote function is extremely powerful. 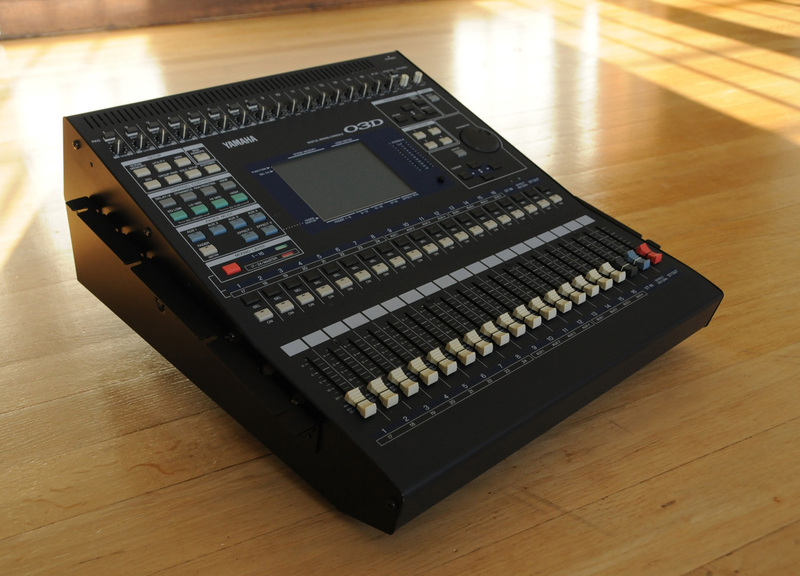 MIDI remote allows the 03D’s motorized faders to remotely control the internal levels in a digital audio workstation, or the faders can be used to edit the internal parameters of an outboard effects processor or systhesizer. 03D faders and four user definable buttons can be used to control other MIDI devices – such as digital audio recorders and processors – via MMC (MIDI Machine Control). A TO HOST (RS422) port permits direct connection to a personal computer without a MIDI interface. Scene, EQ, dynamics, effects and channel library user memory and automix data can be saved using MIDI bulk dump operations to a MIDI data filer (such as MDF2 MIDI Data Filer) or MIDI sequencer. The 03D allows full onboard dynamic automation – unprecedented for a mixer in its price range – of all faders (including the AUX send faders) as well as channel on/off, EQ, pan and surround pan, and scene, EQ, dynamics, effects and channel libraries, can be automated by snapshot. You can easily and quickly update dynamic changes in realtime, and even insert and modify parameters “off-line” using the Event Edit function. There are 4 automix memories and one current memory. Recording and mixdown automation can be synchronized to external MIDI time-code (3NDF, 29, 97NDF, 30DF, 29, 97DF, 25, and 24). 03D’s twin RISC CPUs ensure fast and reliable control of LCD graphics, faders and automix. Internal auto processing is performed at 32 bits by the powerful Yamaha DSP chip, providing a dynamic range of 192dB. Uncompromising sonic quality and performance are guaranteed by 20-bit, 64-times oversampling AD converters on each input and 18-bit, 8-times oversampling DA converters on the stereo and monitor output. Bus and aux send outputs use 18-bit, 8-times oversampling DA converters. The audio dynamic range is an impressive 105dB for analog input to analog stereo output.